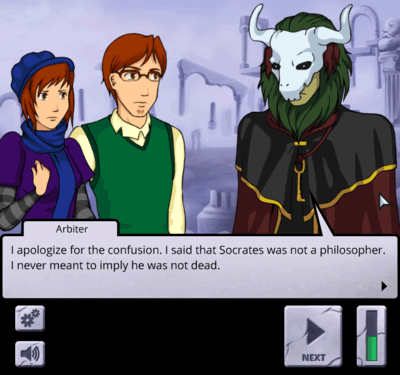 Socrates Jones Pro Philosopher is a Flash game spoof of argumentation sim Phoenix Wright: Ace Attorney. In it, you play as Socrates Jones, an accountant from New York City who learns the basics of argumentation and then goes on to face the greatest ethical philosophers in history, only to discover that philosophy isn't anywhere near as lame as he thought. You begin with a tutorial involving an argument with a deer repellent salesman that teaches you the mechanics of the game, the basics of argumentation, and some of the core values of philosophy, such as hearing an argument out rather than rejecting it on the basis of the conclusion and taking the time to clearly understand your opponent's position rather than addressing a misrepresentation or "straw person" of their argument. The system has to be a somewhat primitive representation of the real-life argumentation process, so you are unable to reject the premises of your opponent, limiting you only to checking your opponent's argument for internal consistency. Even though I was familiar with the arguments and counter-arguments of the material, I still felt challenged during the game as you have to know exactly which premise to use a counter-argument on and sometimes you had to ask for more details to uncover hidden premises and potential counter-arguments that could then be used. Even after using certain counter arguments, you might get "second forms" of your opponent expressed as arguments reformulated in response to your criticisms. This game definitely testing my reasoning and analytic skills, so I thought it was really useful. The game had a wacky kind of humour that was very relatable, as well as fun references that philosophy fans can geek out over. The philosopher's characters were colourfully yet accurately portrayed: Kant was his typical, neurotically predictable foppish self, and Hobbes was incredibly dark and dramatic. Euthyphro was an incredibly arrogant religious fanatic, and Mill was warm and compassionate. Their arguments were also fairly accurately portrayed for the most part. The game had cartoonish graphics that matched the humorous tone of the game but sadly became very repetitive because of their simplicity. Also, it would be nice to enhance this game with some voice acting, aside from just "NONSENSE!" (the Socrates Jones equivalent of "OBJECTION!") as there is a lot of reading involved. The dialogues, with their emotion and character development, are really the focus here and are very well done. In fact, the dialogues were so well done I had to look back and make sure there was no voice acting as the writing was so vivid I remembered the voices I had given the characters in my own mind the first time I played. The music was very simple and repetitive, though it matched the tone of the game well and was switched frequently, so as to keep it fresh. The sound effects were also fairly basic but worked well for their purposes. Again, I would really love to see this game remade with all the bells and whistles because I just really enjoyed it. Even though this game isn't likely to appeal to the average gamer, I still really loved it. I would recommend it for people who are already interested in philosophy and people who are looking for a fun study aide that breaks the monotony of an all-nighter. 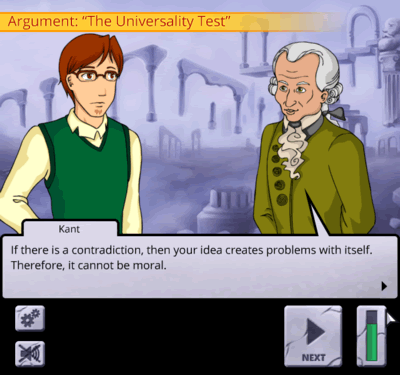 You can easily skip to different chapters with different philosophical figures on the menu, so if you only feel like confronting Hobbes or Kant on a subject you can easily do so. Perhaps one day the public will come to enjoy philosophy so much that such a game can be commercially viable, but until then I will consider this a special treasure for a few devoted lovers of knowledge. You can play this game by clicking here.